The Brisbourne family has been farming at Broomhill Farm, Nesscliffe for over 80 years. 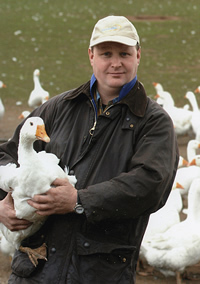 I kept geese as a school boy hobby, when I left school in 1979 it evolved into a farming enterprise. We are a family farm rearing beef and sheep, arable crops and Christmas poultry. We pride ourselves on our poultry having a good life while on our farm. They are reared on the farm from day-olds. They are housed at night in large open plan barns with plenty of fresh air and natural light, with daily access to grass pastures. All our poultry is reared and processed on farm at Nesscliffe. 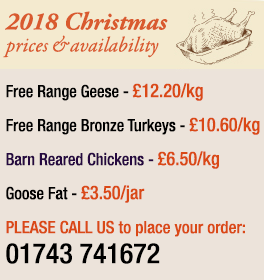 Be assured when you buy a Brisbourne goose or bronze turkey that you are buying from a real farmer, from a real farm, of which we are proud. Our birds are all free range and farm fresh.